The active galaxy NGC 1275 is also a well-known radio source (Perseus A) and a strong emitter of X-rays due to the presence of a black hole in the center of the galaxy. 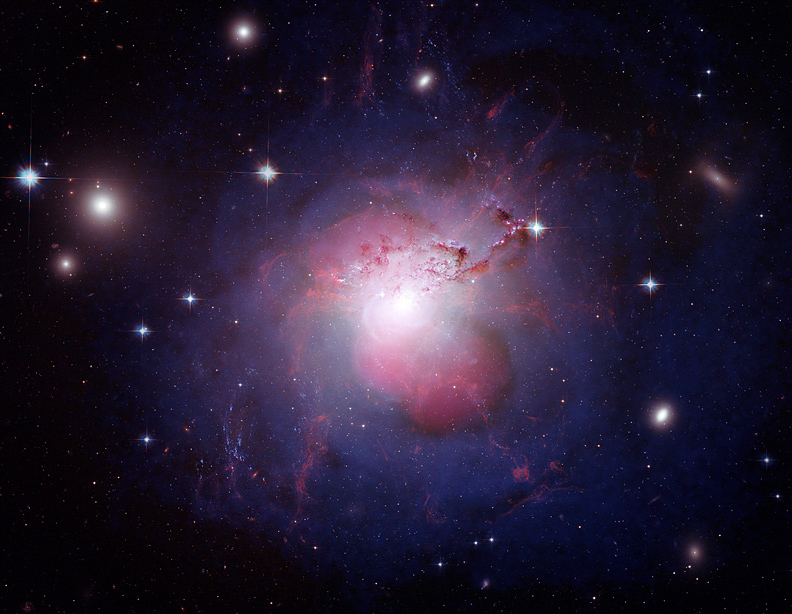 The behemoth also lies at the center of the cluster of galaxies known as the Perseus Cluster. By combining multi-wavelength images into a single composite, the dynamics of the galaxy are more easily visible. Detail and structure from x-ray, optical and radio wavelengths combine for an aesthetically pleasing, but nonetheless violent depiction of events going on at the heart of the galaxy. Chandra data from the Advanced CCD Imaging Spectrometer (ACIS) covers X-ray energies from 0.3-7keV. Hubble data from the Advanced Camera for Surveys covers optical wavelengths in the red, green and blue. Radio data from NRAO's Very Large Array at 328 MHz was also used. 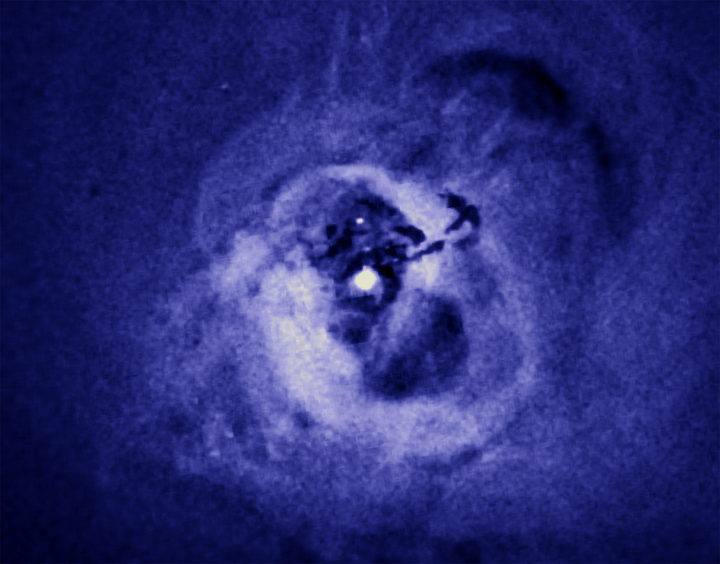 In the composite image, the X-ray data contribute to the soft violet shells around the outside of the center. The pinkish lobes toward the center of the galaxy are from radio frequencies. The radio emission, tracing jets from the black hole, fills the X-ray cavities. Dust lanes, star-forming regions, hydrogen filaments, foreground stars, and background galaxies are contributions from the Hubble optical data. Scale Image is 3.87 arcmin across. Coordinates (J2000) RA 03h 19m 48.10s | Dec +41° 30´ 42"
Wonderful... We can observe more and more how fascinating Universe is.